Shin Goo (left) nad Kim Hyang Ki (right) in Cherry Tomato. The Skinny: A well-meaning film that explores the poor in Korea, this comedy-drama has too much misplaced humor and too many unrealistic portrayals to make it worthwhile. Kevin Ma: There are so many Korean commercial films that look at the lives of middle-class urbanites and wealthy gangsters that it's easy to forget about the country's impoverished. This is one error former TV producer Jeong Yeong-Bae tries to correct with his first feature film Cherry Tomato. Putting poverty front and center, Jeong's comedy-drama tries to highlight the struggles that the Korean poor face everyday. However, the film ends up being a projection of the filmmakers' middle-class guilt with its unrealistic and sometimes over-the-top handling of the subject matter. On the surface, Cherry Tomato is mostly too depressing for the masses and too emotionally manipulative for people who care about the issues involved. Thank goodness for the cute kid. 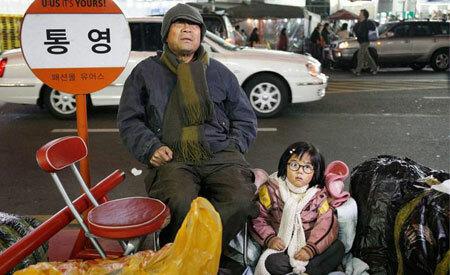 The film marks the first starring role of veteran actor Shin Goo (Christmas in August, Righteous Ties), who plays a grumpy old man who lives in the ghetto with his 6 year-old granddaughter Du Sung (Kim Hyang-Ki). Pops, as he's called by Du Sung, barely manages a living working as a porter and can't even afford to send his granddaughter to kindergarten. Things go further south when Pops' son gets out of prison and steals Pops' life savings to make a new living elsewhere. Out of money and fired from his job, Pops first tries to make it by hauling cardboard on his pushcart (with a complete disregard for territorial agreements). However, he loses both his livelihood and his house when developers force their way into neighborhood and break his pushcart in the process. And that's only the first act. Several things prevent Cherry Tomato from becoming an unrelentingly depressing film. Seven year-old Kim Hyang-Ki is extremely cute as Du Sung, with her bright naiveté complementing Pops' grumpy nature well. Jeong also approaches the grim subject matter in a lighthearted manner, integrating humor into the proceedings. However, it's also the humor that undermines the seriousness of the subject matter. While bits of humor do help the film from time to time, Jeong digresses into random moments of misplaced bathroom humor that inspires more confusion than laughter. By the time Cherry Tomato finally gets serious, Jeong resorts to the oldest clichés of Asian melodramas, trying to get tears from his audience by pushing the tragedy into exploitative territory, which makes the humor seem even more misplaced. Even though Cherry Tomato tries to highlight a realistic subject, Jeong and writer Kim Seong never tell the story in realistic terms. In a strange case of parallel plotlines, the lives of the impoverished are shown in comparison to the extravagant treatment of a development company president's dog. Furthermore, the company president (played by Kim Byeong-Choon, bearing an atrocious hairstyle) is portrayed as a smug and over-the-top tyrant who throws suitcases at glass windows and smiles evilly. The rich are portrayed as selfish people with ulterior motives, while the poor are portrayed as a close-knit group of people who care for one another. Ironically, the company president is the only clear representation to the filmmakers' own social class, making Cherry Tomato seem like an expression of the filmmakers' upper-class guilt rather than a serious exploration of poverty in the style of neorealist films.